still holding it and waiting for good news,this stock can pop real fast,went to $0.64 and $0.74 on a moriarty recommendation. The link on Youtube stopped working so both Rons have the right one. Last Edit: 8 months 4 weeks ago by RonS. Last Edit: 9 months 6 days ago by ron. Gambler as per your message over on ZON, afraid I have no good news on the REZ clouds. This chart looks terrible and does not get much worse and broke below the cloud around 40. Probably means we are at or near a bottom though. I last mentioned support was at 40 and I thought it would hold. I sold at 38 cents, but not just because it dropped below 40, two other indicators got me nervous that I highlight with arrows. Just when it broke below 40, the green ichimuko broke to new lows. Also the blue line came down to the red at the time and I figured it would cross, another negative signal. It is probably ok to bottom fish here, but I won't buy back my position until I see more repair work on the chart. Right now your probably better off buying a stock like ZON with positive technicals on the chart at your back. 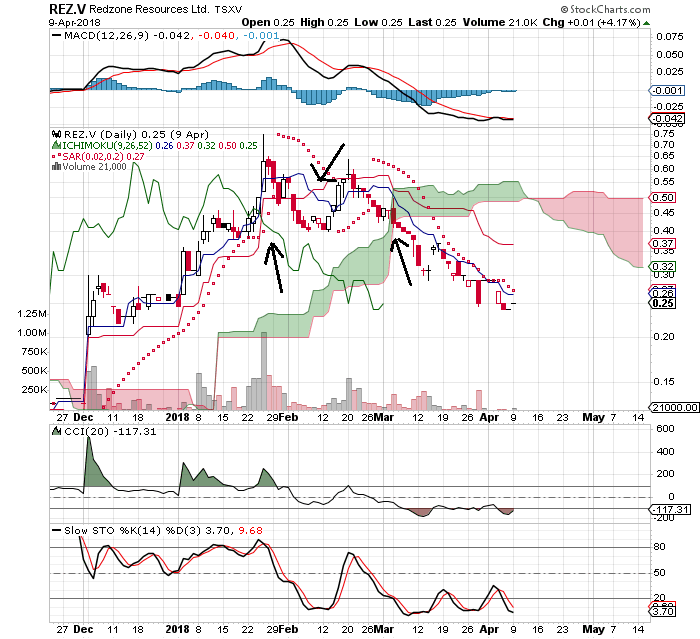 I still hold my core position in REZ, but sold about 3/4.